This is a collection of small QML examples relating to using CustomParticle in the particle system. Each example is a small QML file emphasizing a different way to use CustomParticle. which has access to both the normal image sampler and a blurred sampler, the image plus a ShaderEffect. Fragment Shader just uses the particle system as a vertex delivery system. 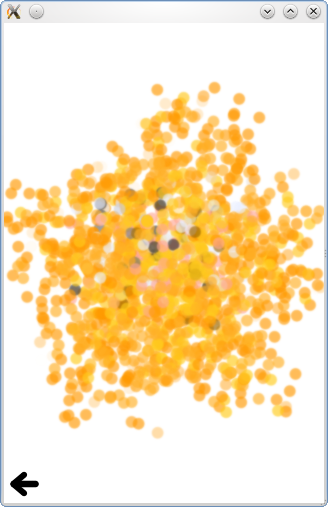 //Uncomment this next line for each particle to use full texture, instead of the solid color at the center of the particle. //fTex2 = fTex2 + ((- qt_ParticleData.z / 2. + qt_ParticleData.z) * qt_ParticleTex); //Adjusts size so it's like a chunk of image. which uses it to determine the color for that particle.